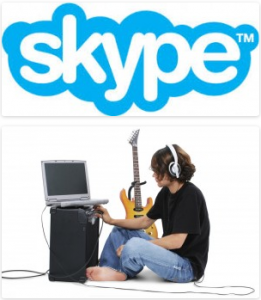 In recent years I have come to specialise in webcam guitar tuition, to the extent that practically all the teaching that I do now is online via Skype. Many people have their doubts when it comes to learning via Skype or other such platforms, but as long as you have a decent connection and a laptop or computer I can assure you it is practically the same as us being face-to-face in the same room. I take great pleasure and pride in having a range of students from different corners of the globe that I teach via webcam, particularly in the UK and USA. I am now based in Seville, Spain but still maintain my long-term students from London and am available to take on new students as well. 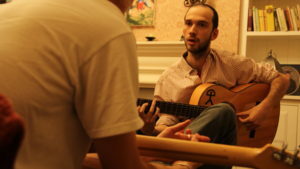 My specialist tuition services such as flamenco lessons for English speakers are in high demand via Skype, but I also teach acoustic and beginner guitar to adults and children as well. The biggest tip I can offer to you to improve your connection and learning experience via webcam is to plug directly into your router with an ethernet cable. These normally come for free with your router or are easily available from any electronics store. As well as this I ask all my students to sit in a well lit place with no distractions and on an armless chair (not a sofa, comfy as yours may be). The only limitations of Skype are playing simultaneously, or of course me being able to physically change your hands or posture! Other than that the experience is an excellent one for student and tutor alike. I supplement all of the lessons with links to print outs and/or videos to ensure you have as much help as possible to progress on your guitar journey.